Looking for design ideas for adding an extension to a period property? Whether you're considering a contemporary extension or one that's entirely sympathetic to your property's period, it’s important to ensure that you opt for a design that suits your needs, while remaining sensitive to the original architecture. Extensions for period properties work best when they are either perfectly seamless and look like they have always belonged there, using materials that complement the existing property, or are more contemporary in style, creating contrast. Your local authority can provide guidance on the types of design that will be acceptable. If you like the idea of extending a house, but don't know where to start, our ideas for extending a period home are here to inspire. Traditional cosy cottages often have small windows, so adding a sunroom or conservatory is a great solution that allows you to balance darker rooms with a brighter space. This beautiful oak frame extension, from Prime Oak, provides a relaxing sitting and dining area for a previously small kitchen. Find out more about planning an oak frame extension in our guide. A contemporary glass box extension was built onto this listed stone country cottage to create an open plan kitchen/dining area. The glazed design flooded the room with natural light, while adding a modern touch to this traditional timber cottage. Minimalist glass doors allows for seamless access to the garden, creating an indoor-outdoor feel by merging the dining area with the patio. 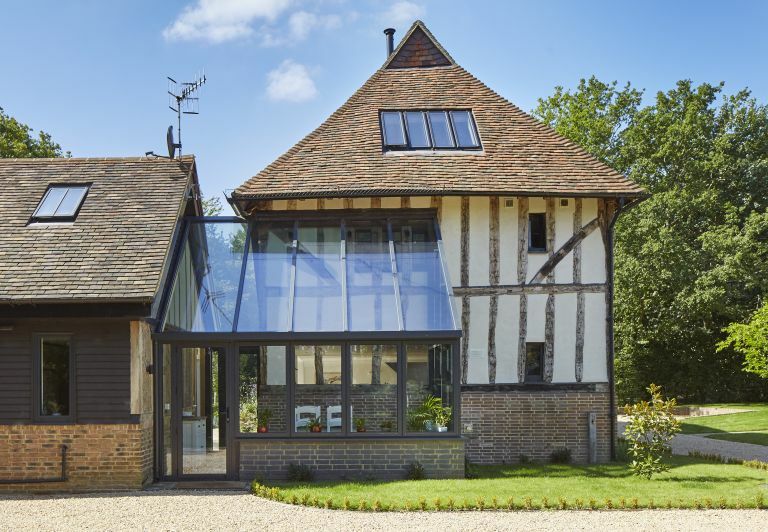 Find out how to plan and design a glass extension in our dedicated guide; read more about what you can do to a listed building, too. With its lower roofline and colour-matched handmade bricks, this oak frame extension complements the original property – parts of which date back to the 18th Century – while remaining subservient. As the main house needed its roof repaired, handmade tiles were used to tie together the old and new sections. The extension was finished with larch wood waney-edged cladding and softwood windows and doors. Read more about choosing cladding and render in our guide. When extending a Victorian terrace, there is often more design versatility than other period properties. The black finish of this modern orangery accentuates the clean lines of the building’s structure while the all glazed design floods the space with light, brightening the pre-existing kitchen and drawing room. Read our comprehensive guide to extending a Victorian house to get yours right. This charming 19th-century home was restored before being doubled in size with the addition of a large extension. When its owners took it on, the formerly dilapidated boxy cottage had cement render covering the stonework.This was removed and the house fully renovated alongside the extension work. Clad in stone to match the existing structure, the new addition is the heart of the home, containing a kitchen and living room downstairs and bedrooms upstairs. Find out how to renovate a house in our step-by-step guide. Abandoned in the 1930s, this 17th-century thatched flint cottage had slowly deteriorated before its new owners renovated and extended it. The two-storey oak frame extension houses a kitchen and master bedroom. A glazed gable end ensures the new spaces are filled with light, while the front of the cottage appears as it would have done when first built. Want to maximise light in your extension? Have a read of out guide to designing a light-filled extension. Typical of the area’s style, this 1930's Sussex house had tile-hung gables above a weatherboarded ground floor, but was cramped inside. An in-keeping extension was added at the rear, housing a living room and sunroom on the ground floor, and two bedrooms upstairs. Lots of glazing maximises views across an unspoilt valley. This stunning single storey oak frame extension, crafted by Border Oak, added much needed space in this Cumbrian farmhouse. With exposed ceiling beams and wooden double glazed windows with views across the garden and fields beyond, it is the perfect place to relax over a lazy brunch. Find out more about planning, costing and building a single storey extension in our guide. This 18th-century farmhouse cottage looks out onto the gorgeous Kentmere Valley in the Lake District. This contemporary style glass-box space at the back of the house replaces an incongruous 1980s kitchen extension. The clever design by Paul Crosby of Crosby Granger Architectsensures that the room is not visible from the road, but makes the most of the gorgeous views. Find out how to plan and design the perfect kitchen extension in our guide. A clever, low-impact sloping design joined to the house via a glazed section, was the solution for this Grade II-listed late 18th Century house, which enjoys an isolated position in the middle of a common. The extension creates an open plan kitchen with views through sliding doors. Inside, the original exterior wall remains intact to minimise impact on the structure, while the house has been renovated. Located in an Area of Outstanding Natural Beauty, this cosy cottage has been extended with a design that is modern while respecting the original building through use of natural cladding materials. The front elevation maintains the look of the original cottage, as all the work is to the rear. A glazed hallway provides the link between old and new. Have a read of our guide to adding a glazed extension to a period property for advice on achieving a similar look. Side returns are often wasted: too narrow to enjoy as garden space, they can become thoroughfares or dumping grounds for garden clutter. However, taking even that small footprint into the house can have a major impact indoors, allowing you to create a larger kitchen diner, and making even a small garden look larger from the new room, as its full width can be appreciated. Find out how to add a side return extension in our guide. Want more information on extending a period property?